Now Available on Pre-Order: Cowgirl Creamery’s Wagon Wheel (Organic) - Zuercher & Co. This month, we welcome the Midwestern debut of Cowgirl Creamery’s first-ever large-format cheese (1/15#) Wagon Wheel was developed in collaboration with Bay Area chefs as a domestic alternative to cooking cheeses such as Asiago, so it melts beautifully in most recipes. 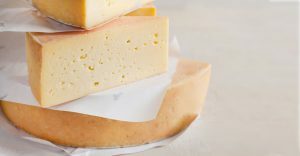 It has a mild, easygoing flavor and as it ages, we’ve found that it develops tomme-like characteristics and a lemony tang similar to regional British cheeses like Caerphilly. Cowgirl Creamery was founded by college friends and California restaurant veterans, Sue Conley and Peggy Smith, in the early 1990’s. Their now-famous cheeses are produced in Point Reyes Station, about an hour north of San Francisco. Wagon Wheel is produced with pasteurized certified organic milk from neighboring dairies.